hope someone finds it so I know where to turn it off. My clock app is up to date. I cleared history and deleted alarm history even restarted phone and Bixby Briefing still only gives time and says have a nice day. Any suggestions?? It's definitely there. I don't use it so I don't know if it's a new feature from an update or if it was there when I got the phone. OHHHHHHH. I had a friend tell me his S8 did it and I ended up getting a briefing alarm that works half the time. I like the briefing even if i forget about when i snooze. 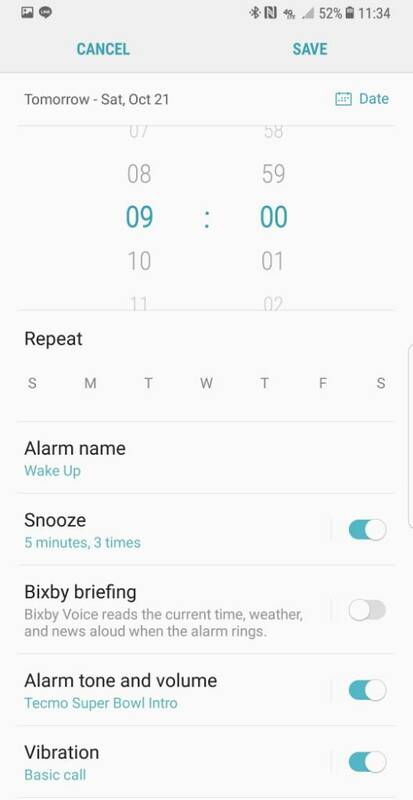 Bixby briefing option has disappeared from my alarm options on my Galaxy S8+. Can't wake up to the jazz sound anymore. What's up with that Samsung? Anyone know how I add it back? How do I change the clock format on the lock screen of Galaxy S5 Neo? How to fix alarm not going off?